At this point in my project, I have now completed all of the counties comprising the Catskill region excepting one, and that is Greene County’s Hunter Mountain. Besides being known for its popular snow skiing resort, Hunter is also notable (with an elevation of 4,040′) as the 2nd highest peak in the Catskill Mountains. Scaling this mountain, which lies along the infamous Devil’s Path, is a noble challenge to say the least. And it’s not that I had been purposely putting this one off until last. It’s just that I had wanted to climb it with my friend Bob Harris, so I was waiting for our availability to synch up, and also to have a fair weather day for us to take on this arduous hike. 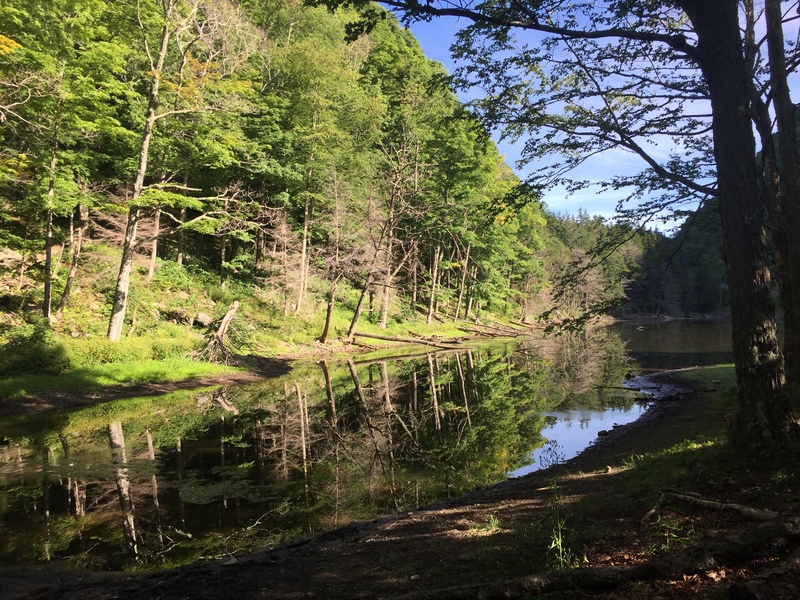 And so it was that Bob and I drove up to the trail head at Notch Lake, just 1/4-mile north of the Devil’s Tombstone campground, and 9 miles north of the Catskill village of Phoenicia. Weather was excellent as we stopped and paid our $6 access fee at the ranger station, and then proceeded to the trail head. Having examined the topo map in detail, we knew that the first segment of the climb was steep, and I have to tell you, it didn’t disappoint. Not only was it steep, it was also extremely technical and rugged. As tough as it was to get through the first mile or so, I knew it would be equally challenging on the way back down. As Bob and I climbed, he told me stories about his friend Steve Hawkins, a talented trail runner with a fairly long list of accomplishments. We stopped only once in the early going to catch our breath and regroup, following red DEC trail blazes all the way to first plateau in the hike. At this point, the surroundings changed from jagged rock to more of a simple, deciduous forest. Fully distanced from the road below us now, the only noises we could hear were those of the mountain creatures. At the 1.7-mile mark, we reached the junction of the yellow trail, where we made a hard right and began the remaining 1.6-mile hike to the mountain’s summit. 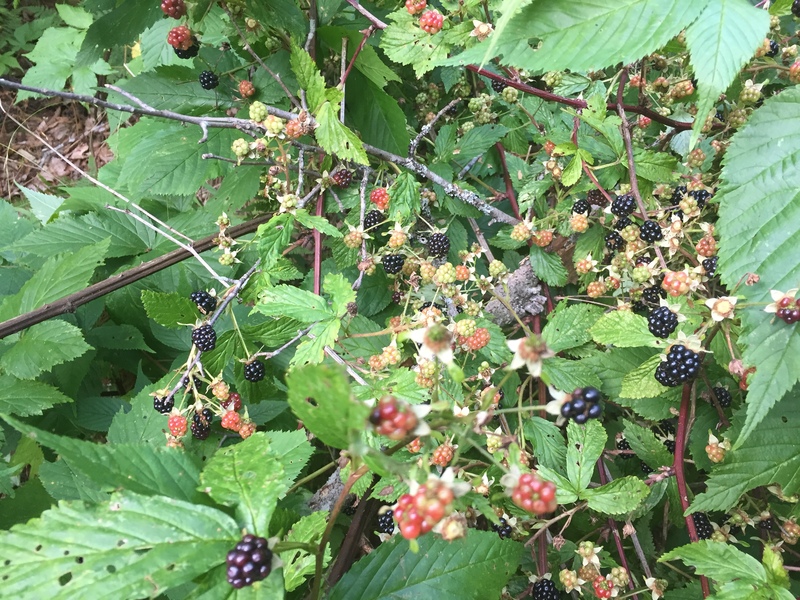 The first section of the yellow trail featured a somewhat rugged tread underfoot, and also lots and lots of mountain blackberries. Endeavoring to be one with nature, Bob and I took a few minutes to eat some of these delicious fruits before continuing on. After a mile or so of traveling eastward, the trail curled north, and with less than a half mile to the summit now, the trail was flat (and quite runnable, actually), and had mountain pines on all sides.The only disappointment in this last section, if there was one, was that there weren’t any notable viewpoints. We came across one short side trail that teased us, but when we got to its end, the view was still quite obscured by pine trees and tall ground brush. After 1 hr and 52 minutes, we found ourselves at the Hunter Mountain summit, complete with ranger cabin, fire tower, and outhouse. With still no views to be had from where we stood, we knew the only option was to climb the firetower, and that we did. The “cab” door was locked, so we had to remain on the stair landing just beneath it. But the views were extraordinary on this crystal clear afternoon, as we could see the entire Eastern Escarpment to the northeast, and the eastern string of mountain peaks of the Devil’s Path to our immediate east. The winds were calm as we stood there and soaked in the view. After taking a few photos and marveling some more at the views, we reluctantly descended the fire tower. But one thing we hadn’t done yet was to find the official summit marker. 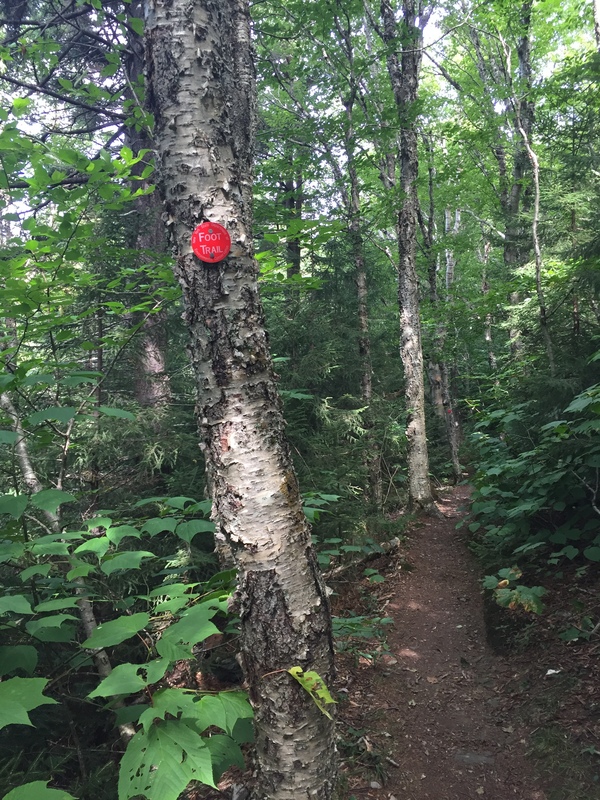 It took a few minutes of skulking around, and I used my AllTrails app to assist us, but we ultimately found the stone marker denoting the 4,040-feet that was the Hunter Mountain summit elevation. 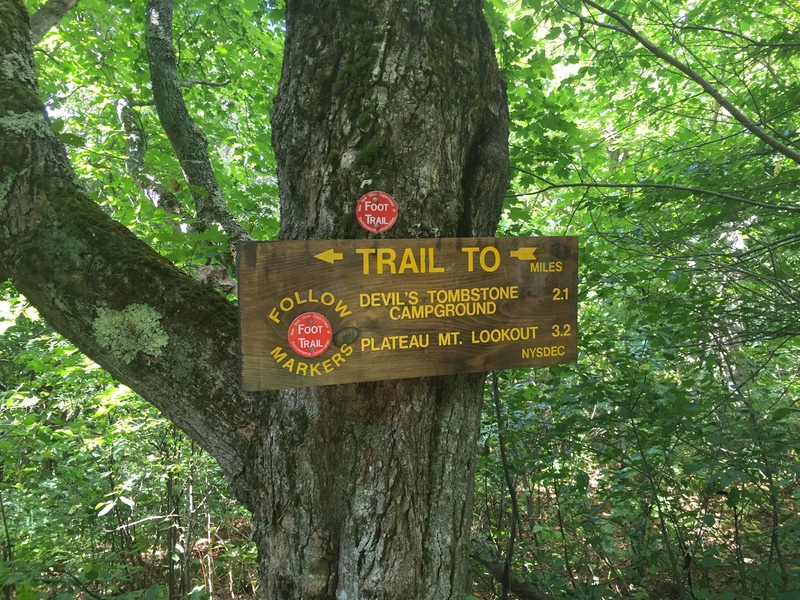 Our return trip went smoothly to the junction with the red trail, whereupon we encountered a couple of young men who had been hiking the Devil’s Path all day, and who inquired how far it was to the natural spring they saw on the map. A quick check of mine showed they were less than a 1/4-mile away from it, and also only 3 miles from their car, which they told us was at the eastern end of Spruceton Rd. Onward and downward Bob and I continued until we reached the steep section that comprised the final mile. 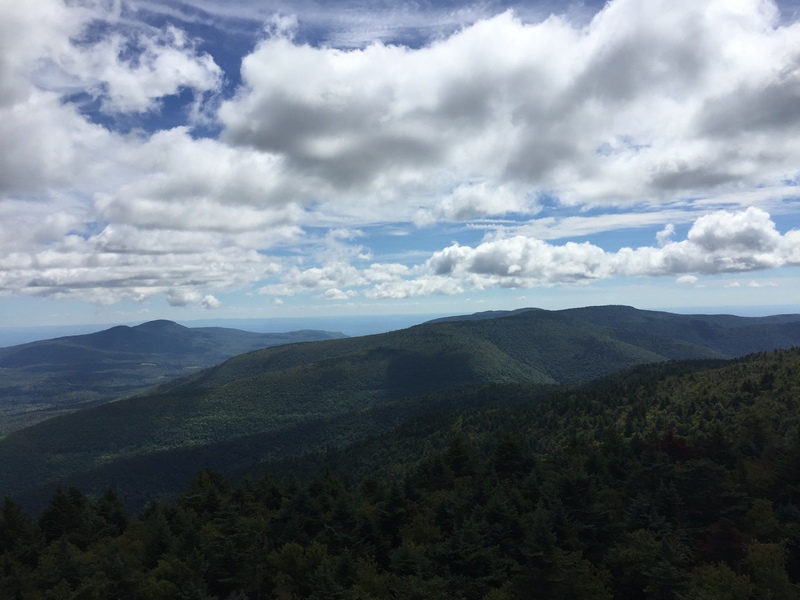 As we began the descent, I remembered talking to my friend Ken Posner a few days earlier, who told me of his aborted attempt to fast-hike all 35 Catskill 3500 high peaks straight through. On that day, he had ultimately come out of the woods on this same descent, and he remarked to me how endless it seemed, especially on tired legs and in the dark. Carrying Ken’s story in my head all the way to the bottom, Bob and I finally arrived back at Notch Lake, and were both able to put a ‘notch’ in our belts for having tamed Hunter Mountain. The last task of the day, of course, was to celebrate with a cold one, which we found at the Alamo Cantina in Phoenicia. A beautiful end to a beautiful day in the woods. 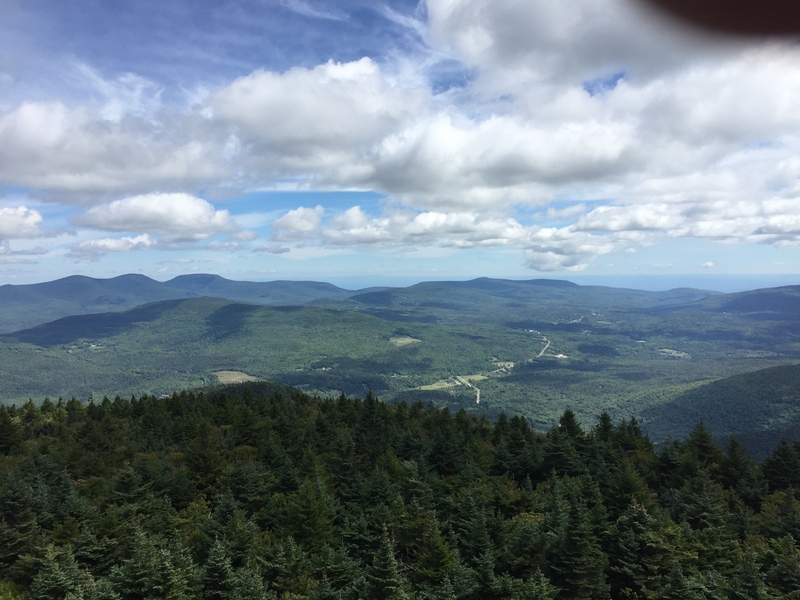 This entry was posted in Trail Running and tagged Devil's Path, Greene County High Point, hiking, Hunter Mountain, Phoenicia. Bookmark the permalink.